Even during the summer months, it can sometimes get chilly at night, so make sure to pack your fluffiest blankets to keep you warm and snuggly in your tent. There’s nothing better than relaxing outside your tent with a nice hot drink watching the world go by. Make sure you have a decent mug which isn’t breakable – Miffy has just released a range of enamel mugs which are ideal and very stylish. Be sure to bring along enough clothes to last you for your entire trip – you don’t want to run out of socks, do you? Keeping those little pinkies nice and cosy is essential. Make sure you take plenty of activity books and reading books on every camping trip. With the early mornings, late nights, fresh air and endless play opportunities, most little ones need some quiet time in the afternoons to recharge their batteries, and books are perfect to keep them occupied in a tent. 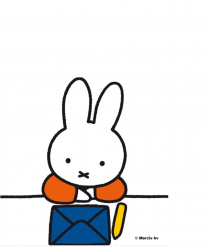 The Miffy Dress-Up Colouring and Sticker Book will keep them entertained for hours or ‘miffy in the tent’ is ideal to get everyone excited on their first night! Why don’t you go exploring with your family, visiting local shops and sights to see what the location you’re in has to offer? You might even find something you really like to spend your pocket money on! One of the best things about camping is that no doubt you’ll be surrounded by lots of other children so it is easy to make friends and have even more fun running around together! On Friday 26th August, you can watch ‘Miffy’s Camping Adventure’ – an episode of Miffy’s Adventures: Big and Small on Tiny Pop at 11.30pm for some ideas.